This week I am in Berlin; not because of the Green Week (which seems to have gobbled up all hotel rooms) but for a meeting of experts from OSGi Alliance, HGI, Broadband Forum, and UPnP Forum that was organized by Deutsche Telekom Laboratories . Eleven years ago we optimistically started defining a service platform for the home and utterly failed when the Internet bubble imploded in 2001. However, it seems that the seeds we planted then were not destroyed in the long drought since 2001, there is a surprising amount of activity in this area. 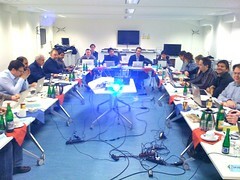 The reason for this Berlin meeting is that is a flurry of activity around the home gateway. The HGI is looking at adding an execution environment, the Broadband Forum is working on a management model for execution environments on gateways, and the UPnP Forum has been working on managing an execution environment through UPnP as well (UPnP DM). And OSGi, well, we've been doing things in this area since the last millennium. It is really good to have these different groups around the table. It turns out our maturity is a huge advantage. Though all the planned execution environment plans on the table clearly do not restrict themselves to OSGi, OSGi is in all cases a primary candidate. This seems to work out very well for all parties. OSGi is quite mature and is based on a lot of real world experience. This is a good test case for the different models and it of course ensures that the intricacies on OSGi are well supported. It is a good sign that these different organizations are collaborating this much, lots of energy in the room!